Chanced upon Clawdaddys at Bonifacio High Street, and with our love for seafoods we came across Clawdaddys boiling bags. A concept that is definitely quite new in the Philippine market, and is sure to make you craving for more. 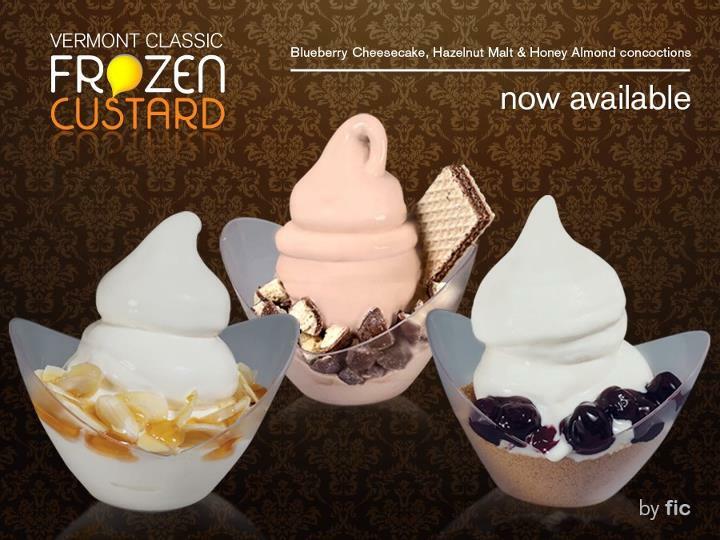 Have a taste of the new health sensation that is Vermont Classic Frozen Custard by FIC. Head over this weekend to the South Court of Powerplant mall and get to enjoy FREE samples. Trust me they are uber good!!! And best of all it's healthy and delicious. You may also enjoy them at Lulubelle (R3 level) starting today. Get to enjoy flavors such as Blueberry Cheesecake, Hazelnut Malt and Honey Almond. of P500 worth of J.Co Donuts and Coffee GC's! 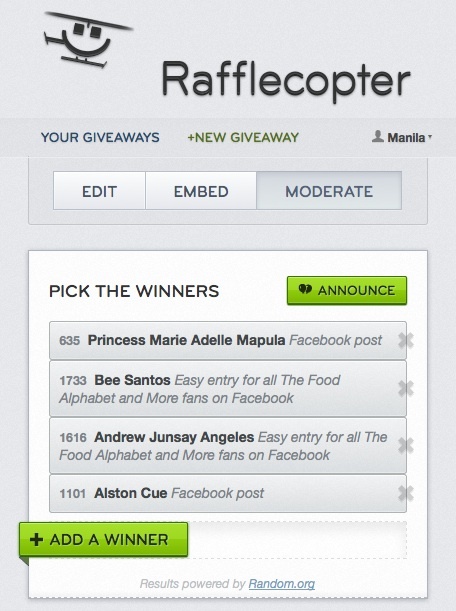 Congrats once again to the winners! Please expect an email from me as to how you can receive your prize. 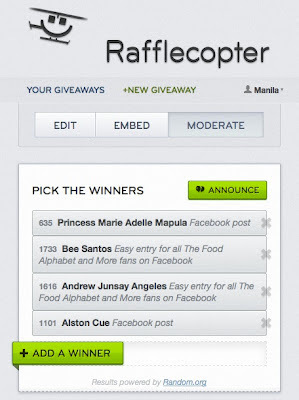 Thank you everyone for joining, and expect more giveaways to come. Hope you could join again. Love desserts? Then you'll definitely fall in love with Seattle's Best new offerings! Yes we all love cakes, but Seattle's Best made something even better. By making the best loved cake desserts into drinks that fill us up with happiness. Presenting to you the SBC Heavenly Cheesecake and SBC Red Velvet. Both these mouth-watering confections are available in Hot Mocha and ice-blended Javakula. SBC Heavenly Cheesecake is a perfect blend of our smooth coffee, white fudge and cheesecake bits topped with a cloud of whipped cream and graham crust. While the SBC Red Velvet is a harmonious mix of our coffee, red velvet fudge and chocolate chunks, covered with whipped cream and red velvet crumbs. It's awesome that SBC made this, well at least we can have our favorite desserts and coffee in one! I just love how it tastes, period. What's best is that you get the full creamy goodness of your favorite desserts without sacrificing the taste of smooth coffee. Just perfect, kudos SBC! Great job! Try out these new drinks and you’re sure fall in love with them, happy times ahead. Visit your favorite Seattle’s Best Coffee branch today. Like Seattle’s Best Coffee Philippines on Facebook. A place to unwind with friends, enjoy great dining atmosphere and of course great tasting food. Krave Restobar sets the bar high, and leaves others with envy and praises as well. Casa Armas Tapas Bar, a landmark by its name opened their Greenbelt 2 branch a couple of months ago, is home to the best Spanish cuisine, that is reminiscent of the best-loved dishes of our Lola's cooking. Coupled with modern furnishings, and a laid back set-up, customers can see themselves unwind and enjoy the relaxing atmosphere while having dinner with family and friends. J. Co Donuts and Coffee, opens their 3rd branch at Greenbelt 3. After their successful opening at SM Megamall and SM Mall of Asia, here they go again and they are bringing smiles to everyone in Makati. The formal opening was graced by no less than the J.CO brand ambassadors led by international TV personality Karylle and sought-after actor Luis Manzano together with supermodels Kelly Misa and Robby Mananquil. Oliva Bistro Cafe, owned by Chef Kannan Jayaprakash Sreedevi, drew inspiration from his many years of working as a chef in different parts of the world, and finally having stayed in Singapore for so many years, met his other half in his wife. And with that they moved to Manila and Oliva Bistro Cafe is now a thriving place of great food, treated with love and care.